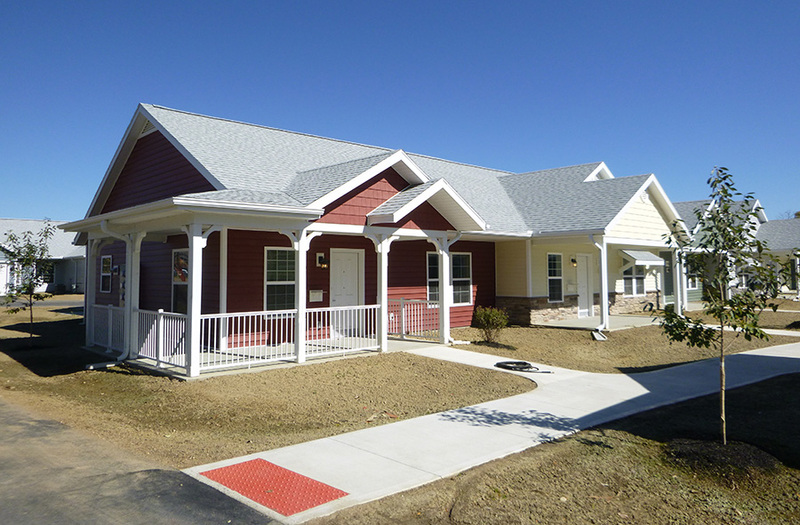 The Community Gardens is a new construction, affordable senior rental housing community located in Springfield, Clark County. The project consists of 50 two-bedroom units based in a "pocket neighborhood" development. Pocket neighborhoods are small, pedestrian-friendly neighborhoods within a larger development, creating opportunities for social interaction and building a strong sense of community among neighbors while also preserving a need for privacy. Project amenities include a playground, greenspace, a gazebo, a health clinic and pedestrian walkways connecting shared green and recreational spaces throughout the development. Each ranch-style unit is fully accessible, has attached garages, washer/dryer hookups, ceiling fans and covered front porches. The project is seeking certification through Enterprise Green Communities. The Clark County Combined Health District, in conjunction with the project, is redeveloping an existing building on an adjacent parcel to house a nurse practitioner health clinic provided by Community Mercy Health Partners. The project is on a bus line with fixed route and paratransit services with a potential for expanded service hours to accommodate residents. The project is in close proximity to community, social and recreational opportunities. This development was selected due to community investment, local economic development and exceptional development for creative design.